On Wednesday, 19 November ‘This Is Your Life,’ in colour, returned to your Television screen. The format has hardly changed since the last series. The show begins with the ‘pick-up’ – Eamonn lying in wait for the subject, who walks unsuspectingly into a carefully laid trap. Normally, this will be recorded in advance, often on an outside location using a mobile VTR unit. Then, after as short an interval as possible, the subject is brought back to the studio and the show begins with a playback of the pick-up. Board Room Conference. From the left – Margaret Thistle, Mary McAnnally, Jack Crawshaw, Tom Brennand, Robert Tyrrell, Nina Powell, Eamonn Andrews, Roy Bottomley and John Stapleton. The subject is then brought on stage and Eamonn begins the show proper in front of an audience of about 150 to provide a reaction as the story unfolds and each guest makes his or her contribution to it. In the following articles Eamonn reflects on some of his experiences during the original series, Robert Tyrrell, Producer, accounts for the series’ former success, and Nina Powell, Programme Organiser, explains how the show is put together from the early planning stage through to transmission night. 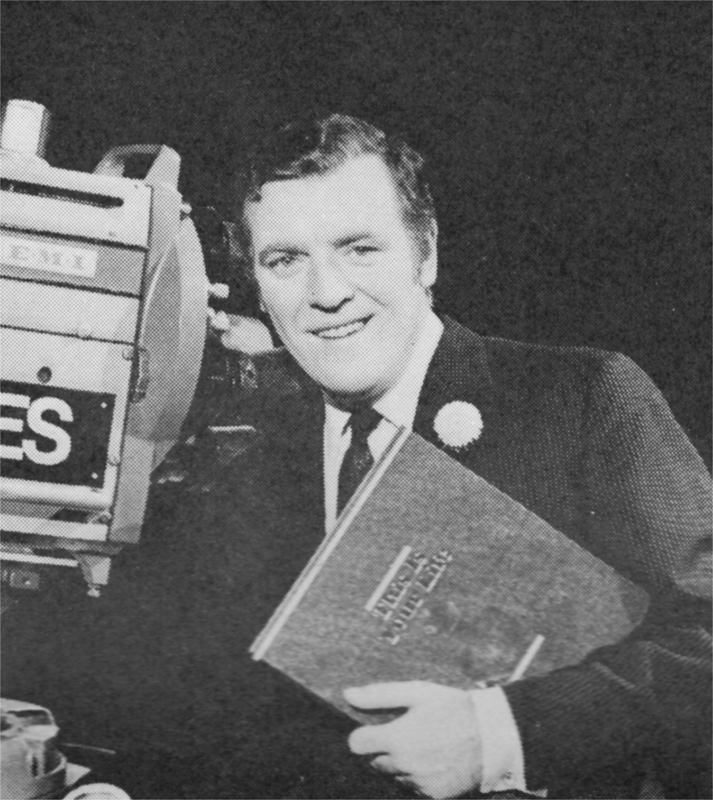 Eamonn Andrews has had the unique experience amongst those associated with the ‘This is Your Life’ team of having actually been one of its subjects in the original series. This situation arose when the ‘Daily Sketch’ broke the story that Stanley Matthews had been chosen for the programme. Although Matthews was on a fishing holiday at the time there was no way of ensuring that he had not seen the article. With only days left before they were due to go on the air an emergency conference was called to discuss an alternative subject. During this, unbeknown to Eamonn, Ralph Edwards walked behind his chair and indicated to the others that Eamonn would be a good choice. Hastily they got rid of Eamonn on the pretext of having to attend another meeting elsewhere and arranged to see him later. Immediately they started to research into Eamonn’s background and then told him that Freddie Mills, a friend of his, had been chosen. A dummy sports programme was arranged and Eamonn instructed to keep Mills occupied for the whole day. Mills was, of course, let into the secret and the two of them spent the entire day trying to keep a straight face, each believing that the evening programme was about the other. One incident that almost gave the game away was when Eamonn invited Mills back to his home for dinner – Eamonn’s wife was in the process of getting ready to appear on the show and half an hour before the programme was due to begin a car arrived to take her to the studio. She had to go to the door, send the car away and then hastily concoct a story for Eamonn about who had called. A series such as this always provides a fund of stories about awkward or amusing incidents. They are funny on reflection but at the time one can imagine what a source of anxiety, frustration and strain on the nervous system they could cause. Eamonn recollected one incident when the subject chosen had to arrive at the Shepherd’s Bush Television Theatre. As the programme was ‘live’, timing was crucial. The subject was attending a conference nearby and at a prearranged secret signal by telephone he was to be brought to the theatre. Instead of leaving instantly, as was expected, quite a hiatus arose when the decoy said “Let’s go” and the subject decided to go to the loo first – a reaction no one had anticipated and consequently allocated no time for! The best story, however, concerns Stephen Behan, father of Brendan Behan. The programme was done in Dublin as there was no way of making him leave the place. He had never been seen anywhere without his pipe and before the show began, someone had removed his overcoat, in which he kept his tobacco. A Researcher realised that he wasn’t smoking and went through his pockets looking for the tobacco. He found a white paper bag and proceeded to crawl across the stage, out of the range of the cameras, to hand the package to him. 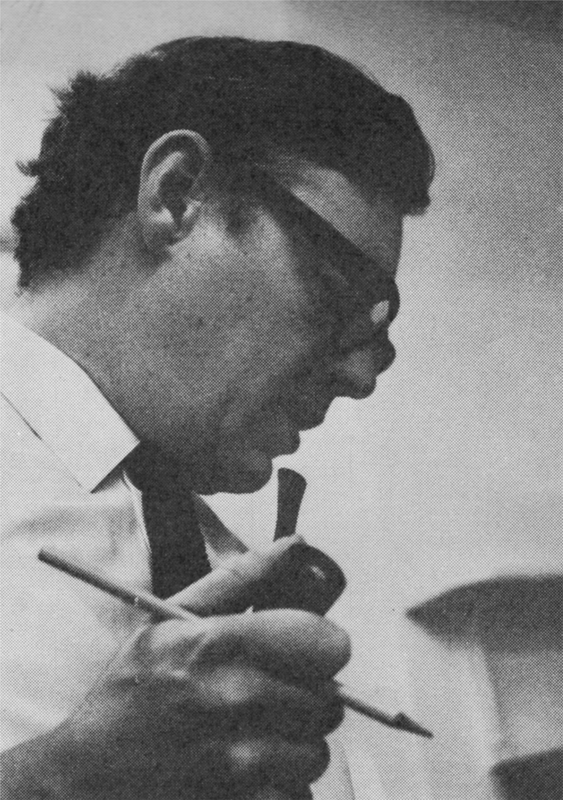 Stephen Behan was a house decorator and the Researcher was unfamiliar with that profession’s habit of carrying supplies of tea and sugar mixed together to use during tea-breaks. It was this concoction the Researcher had handed him – not tobacco, and Behan consequently filled his pipe and tried to smoke it. If you want to make your fortune, think of a better idea for a television series than ‘This Is Your Life’. Mr Howard Thomas and sundry other gentlemen will welcome you with open cheque books. But the chances are you will fail for ‘This Is Your Life’ is probably a unique classic in the history of Television. No other show combines so much under one umbrella – surprises, drama, laughter, pathos, sheer human story-telling. Even after years off the air it still sparks off instant response from both viewers and professionals. When we began to think of it, we tried to pull it apart and see what else we could do with it, but like the little boy with the alarm clock we discovered that it didn’t tick any more. So we’ve put the works back together the way they always were. The big difference between our show and the BBC’s will not be in the mechanics – they’re near perfect – but in the choice of subject and the presentation. Wild horses would not drag from us the names of the subjects, because the old rule still applies. If the secret gets out to the subject in advance, we cancel the show -and nobody wants to see all those weeks of investigation go down the drain. That’s why if you overhear our conversation in Betty’s Bar (now one of our chief conference rooms) it is peppered with code names, hints, nods and winks. We don’t even tell our wives, lovers or mothers. Apart from that the team (most of us new to Thames) are talkative enough. 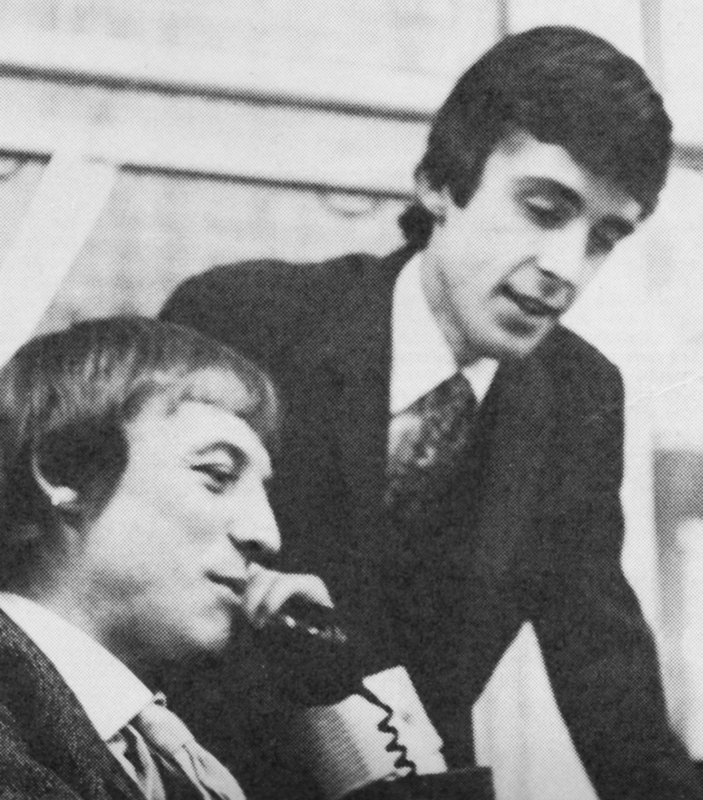 Jack Crawshaw and John Stapleton, late of Fleet Street, do our interviewing and report-writing; Mary McAnnally, late of BBC ‘Man Alive’, does research; Nina Powell, from Anglia Television, organises, administrates and looks after guests, while Tom Brennand and Roy Bottomley edit the scripts. 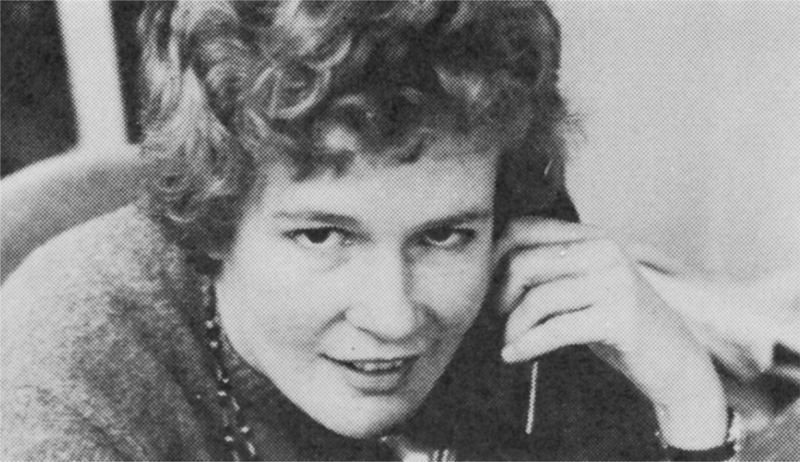 Marjorie Baker directs and Margaret Thistle is PA.
Our moment of truth will be at 7 p.m. on Wednesday 19 November, during the first week of colour transmissions. On that day, someone will walk blinking into the lights to be told ‘This Is Your Life!’ Next week, who knows – it might even be you! The CIA, FBI, MI5, Special Branch and any similar organisation could learn a great deal from the maintenance of security by the ‘This Is Your Life’ team. Programme Organiser, Nina Powell, plays an important role in connection with security. Because, for obvious reasons, the security of a programme of this nature is so tight, it was difficult to obtain detailed information about what goes on behind the scenes. However, after knocking three times, asking for Nina, inventing a password and swearing on oath that my great-greatgrandfather was not a ‘Commie’ or in any way connected with the ‘other’ channel, I was eventually allowed into their inner sanctum and given an outline of how the team operates. 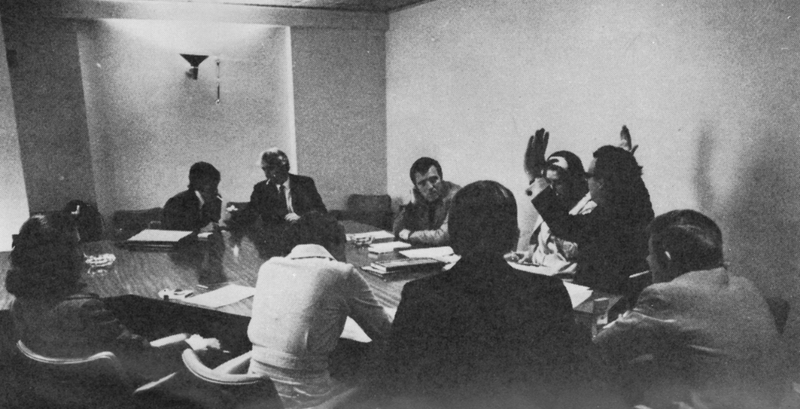 All planning starts with a regular Thursday meeting in the Board Room behind locked doors, having previously ascertained that the room has not been bugged and any unwanted intruder has been removed from under the table. At the meeting possible subjects are discussed with emphasis placed on choosing a balanced selection of people, i.e. they don’t do ten shows on pop singers, followed by ten shows on actors, followed by ten shows on comedians. When a possible subject has been chosen as much information as possible is obtained from back issues of newspapers by Mary McAnnally. From these she compiles a skeleton biography. Then the Investigators take over and without referring to the programme by name, they ring up the people closely associated with the subject. From these enquiries the most suitable guests are chosen and sworn to secrecy. To add an element of surprise a guest is sought, close to the subject, but who has not been seen for many years; on alternatively a person much admired by the subject but one whom he has never had an opportunity to meet. When the Researchers and Investigators have completed their work, the information is passed to the Scriptwriters. 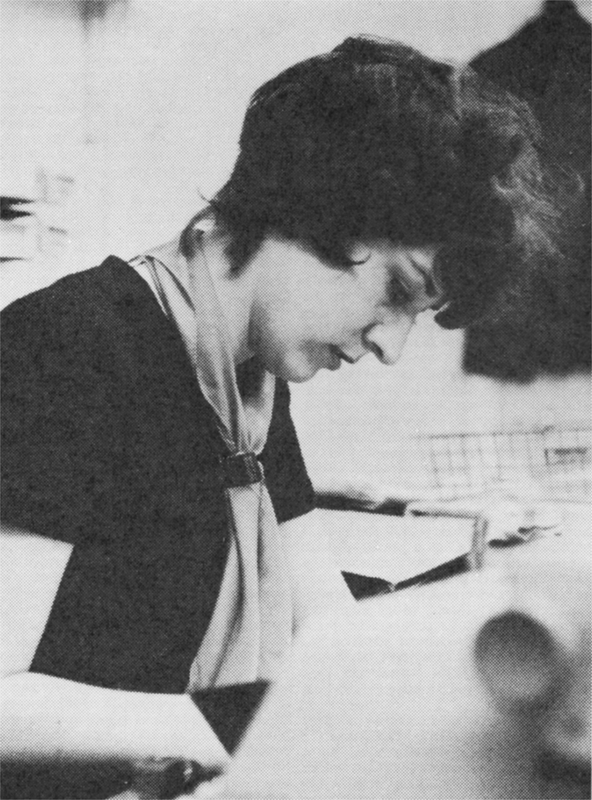 His draft script is discussed and when finally approved, Mary McAnnally searches for stills or any other material required to illustrate the final story. This is a fairly superficial outline of how the operation works but because of the stringent security precautions imposed there was little else Nina could reveal. It’s a bit like the man in the commercial for a drink that shall remain nameless, who clambers into a telephone kiosk and starts to whisper, “The secret of Sch… is…” and is suddenly whisked away to an unknown destination by a mysterious enemy. In dealing with this department, a little knowledge is a dangerous thing so if you are unfortunate enough to discover something you shouldn’t, keep quiet about it – and stay out of telephone kiosks!